These photographs from 1980 show the same jetties as above together with an even more distinctive circle on the left where the Iron Age fort is located. The white line running through the fort area marks the front ditch of the Norman fort, which is located within the Iron Age perimeter. This high contrast print emphasises the two ditches or tracks that run round the front of the Saxon site. It is best viewed at arm’s length. Tramlines run south to the headland with signs of habitation close to the marsh. There is an interesting feature in the bottom corner of Sandrock Field, which coincides with the image created in the early Spring crops. 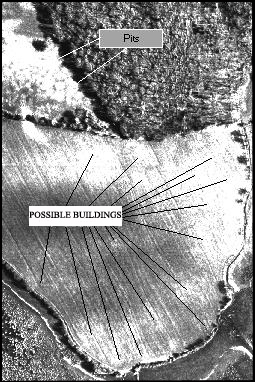 This runs across the field in the original photograph and may be a building, which would explain the mystery of the square corner to the marsh on the western side. This shows the field to the west of the Monkham inlet before the crops have been sown. 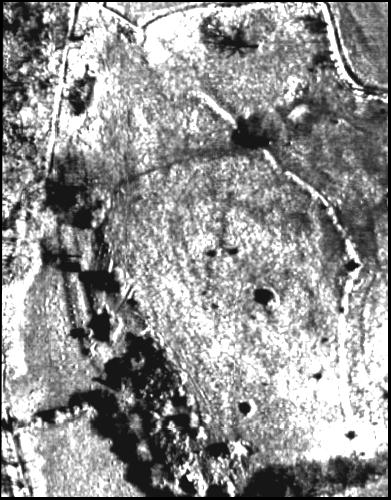 Large circles can be seen running along the edge of the inlet suggesting buildings existed on the site at some stage in the past. The field to the west of Monkham wood is completely covered with pits, which show as white circles. These were most probably used for iron extraction and indicate a huge industrialisation process, far greater than has ever been imagined to exist in this area before. The size and extent of the ground markings is so great as to indicate the existence of a very large community which has to date been completely lost to history. Further on-site examination is essential in order that these markings can be fully investigated and the potential for the site investigated. 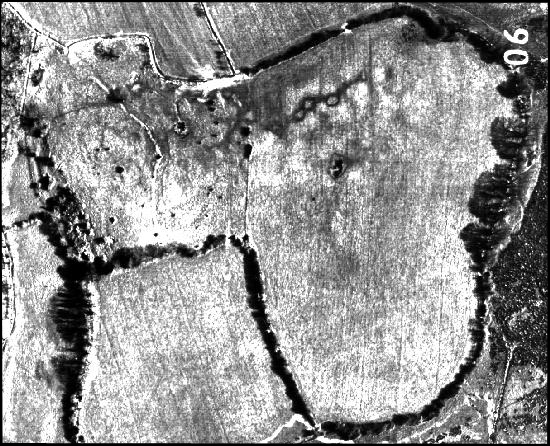 The final photograph from the National Library of Air Photographs shows the three features, Saxon, Iron Age and Roman elements all together. 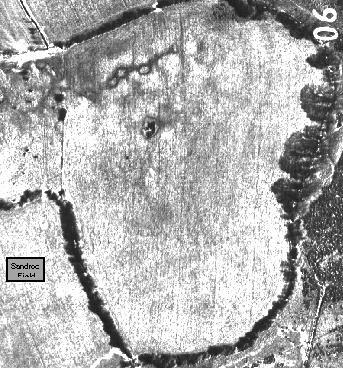 The Norman element has still to be discussed and this can be found within the Iron Age element north of Sandrock Field. The front perimeter ditch is shown as a white line crossing the left hand corner of the site.